Fuel Line Assembly - Chardon, Ohio - Chardon Metal Products Co.
At Chardon Metal Products Co., we managed end-to-end production of the fuel line assembly highlighted here. Designed for use in a locomotive, it featured overall dimensions of 8.0" in length x 5.0" in width and all carbon steel construction. Production involved many of our core capabilities, including tube bending, CNC milling, and screw machining. 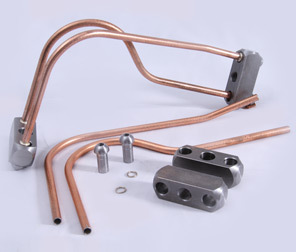 In addition, we used an induction brazing method to create joints with high tensile strength, and developed a custom fixture for leak and pressure testing of the final assembly. Our facility houses a diverse range of equipment for tube forming, and we used a rotary bender to reproduce the bend sequences with a high degree of accuracy and repeatability. During production, we also leveraged the precision and power of our CNC mill as well as six-spindle screw machine. In the hands of our expert technicians, this equipment allowed us to work at a fast pace to keep both the timeline and cost profile on target. 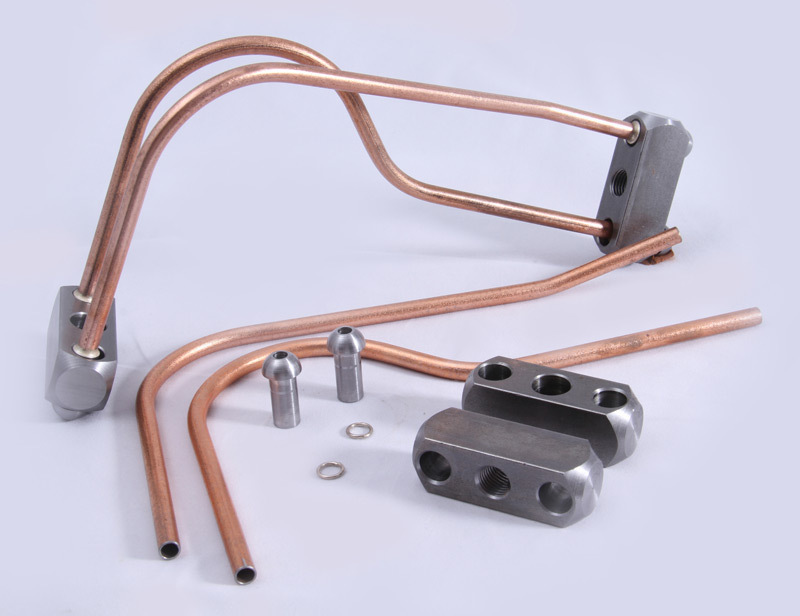 We identified induction brazing as the preferred method for joining the components together. Our brazing process created joints that were unyielding, repelled gas and liquid and tolerated exposure to the high shock and vibration forces found in a diesel locomotive without degrading. Once the assembly was completed, we conducted a full battery of leak and pressure tests. Having a custom designed fixture facilitated testing and promoted a high degree of accuracy in the results. We used numerous other quality assurance procedures, both in-process and pre-shipment, to assess dimensional accuracy, thread quality, and many other aspects of the product. This quality-built assembly keeps the fuel lines in powerful diesel locomotives operating at peak performance. We manufacture them in quantities of about 6,000 per year. To learn more about this project, or any of the processes involved, contact us today.